Yellow ear slider found eaten by ants in front yard!! • Bearded Dragon . org . I was coming home and saw what I thought was a big dead turtle in my yard. Not a shocker as people speed down my road. But it was not a land turtle but one a turtle from our local park. It was getting eaten by ants. Then I saw his leg twitch. He had a hook in his face and was frozen to the touch my guess was someone caught him tossed him in their cooler and he fell off the truck. He has a crack on the side of his shell as well. We got the hook out and for now he's In a tank with no water he's on a reptile heat pad and a basking light. I'm misting him with filtered water to make sure he doesn't dry out. Re: Yellow ear slider found eaten by ants in front yard!! Really quick he's awake blinking and walking now. But his front leg won't move. It might be broke. Oh no poor guy! Does he have any open wounds that you can see? I'd keep him on something soft to minimize impact. A good vet may be able to repair the damage to his shell. I'm not sure if that's the most serious issue or not though. Last edited by CooperDragon on Fri Jun 09, 2017 4:01 pm, edited 1 time in total. 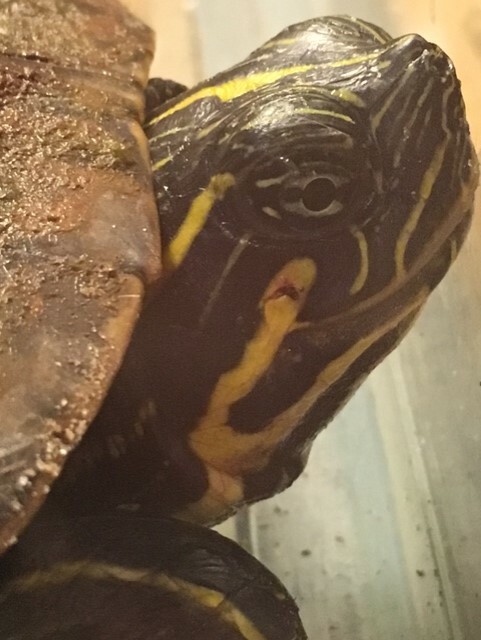 He has a crack in the side of his shell. A hole In his jaw from the hook and I'm worried his front leg is broke. I'm not sure how you'd splint the front leg but I would try to minimize movement as much as you can. He will probably need antibiotics while he heals up. If you have some raw honey I would apply it to the wound on his face to help protect it. Do you have some povidone iodine solution you could use to try and clean the wounds a bit? It may help reduce the risk of infection if you can clean him up a bit but I wouldn't do too much to avoid causing too much stress. I'd try to keep him comfortable and bring him to a good vet if you can. it's a full puncture wound on his face and neck. He also just pooped and there was a couple of dots of blood. unfortunately I don't know if I have many reptile vets in my area. Not a big reptile loving place here. I called the woman who I buy my beardie's food from she's a reptile store owner and I'm hoping she and her husband can help me reach out to someone who works with rescue animals. He also has algae all over his shell should I try to clean that off? he's not frantically moving around now; he's bobbing his head a lot though. he's sort of buldging out the bottom of his throat then again he did have a hook in there. I'm going to let him rest some so he can calm down more and keep checking on him to mist him. I'll keep a lookout on this thread I'm trying to find any vets that might could help him in my area no luck so far. Most don't even work on the weekends here. I do not have any iodine but I am running to the store to get some now. I wish I could offer more advice but I have no training and knowledge of turtles. 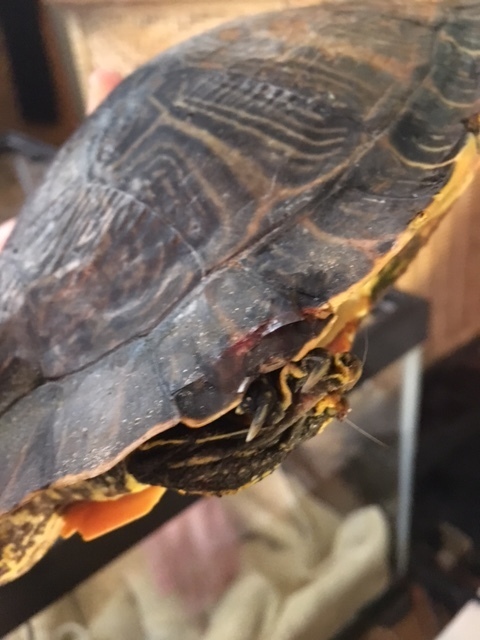 My gut says to clean his wounds, make him comfortable, and try to get the shell repaired though. The blood in the poop is a concern because it may indicate internal bleeding. I don't think there is much to do about that except wait and see if it heals on it's own. Do the best you can, I'm sure he appreciates you giving him a chance. I know I do. Good luck!